Is PMS a real, relatively severe, physiologically-driven condition, a psychosomatic malady socially constructed by the medical profession, or simply the figment of stressed out women's imaginations? Perhaps men should not be blamed for wanting a definite answer to the question of whether PMS exists, when, exactly, it occurs, and what, exactly, the symptoms are. There may indeed be a fine line between completely denying the existence of PMS and demanding its existence to explain the experiences and behaviours of women, but there is plenty of space for any given woman to manoeuvre. If she commits an indefensible act at work, she can put the blame on PMS as a medical condition. No challenging a medical condition. But if PMS is later cited by management as a possible contributory factor in her low level of productivity during certain weeks, she can sue for sexual discrimination. This doesn’t seem fair. But even if men have their way, there’s no simple way out of the conundrum that either “solution” is likely to cut in both directions. If PMS is a figment of unhappy women’s imagination, than men can ignore the complaints and proceed as usual, but this also means that an angry wife has a legitimate gripe that can’t be explained away as “that time of the month”. Yet if PMS really does create dramatic mood swings in women, then men can continue to dismiss “unreasonable” female behaviour on this basis, but the price is that it becomes accepted as a “real” phenomenon capable of seriously altering women’s moods, even to the point of “causing” them to kill men. That’s right. 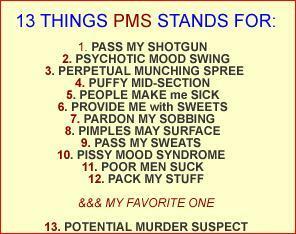 PMS has successfully been used as a defence in murder trials. In the first, Sandie Smith stabbed a fellow employee to death in the tavern where they both worked. During the trial, Katharina Dalton was brought in as an expert witness for the defence after Ms. Smith’s dad noted that she got particularly, though not always homicidally, bitchy just prior to menstruation. Dr. Dalton’s solution? Heavy doses of progesterone, of course. And Ms. Smith’s behaviour improved, so much so that the judge sentenced her to 3 years probation. Now we have already established that placebos in drug trials often attenuate the symptoms of PMS. And in this case, Ms. Smith had an obvious incentive to “get well”. It strengthened her PMS defence and allowed her to avoid life imprisonment. Is it possible, just possible, that she fakes it? Roughly one year later, Ms. Smith was back in court charged with threatening to murder a police officer. Her defence? Dance with the boy who brought you, as they say. PMS had returned, her lawyer argued, because Dr. Dalton had cut back the dosage of progesterone. Katharina Dalton was once again called in to testify that indeed she did cut back Ms. Smith’s dosage. Once the dosage was increased, Ms. Smith’s violent behaviour subsided again. Miracle drug that progesterone! Ms. Smith once again received 3 years probation. Ouch! But it gets better, or worse depending on your perspective. (Yes, I know I used that one already). Christine English murdered her lover Barry Kitson by slamming her car into him and crushing him against a utility pole. Once again Dr. Dalton’s testimony was critical in getting the defendant off the hook completely. Well, not completely. Ms. English was not required to undergo medical treatment or even put on probation, but she did have her driver’s licence suspended for one year. Apparently, the court took precaution in case she was planning to murder another boyfriend, by requiring her to find a new murder weapon. The media coverage of the trial largely missed the fact that menstruation had been used as a defence for violent and non-violent crime for decades. In 1845, a domestic servant named Martha Brixey was acquitted of murdering one of her employer’s children on the grounds of “insanity probably arising from obstructed menstruation”. In that same year, Ann Shepherd was acquitted of stealing a fur boa due to suppressed menstruation, a condition ironically described by the presiding magistrate as making her “periodically erratic”. What is interesting is that no attorney yet has successfully argued for a male client’s innocence on the basis of unusually high levels of testosterone, yet the link between the dominant male hormone and violent crime is far more direct and scientifically established than any connection between menstrual cycles and violent crime among women. And which forensic phenomenon is more worthy of scientific and legal attention? Men commit the vast majority of violent crimes; 85 – 90% of all murders, 85 – 90% of all aggravated assaults, 90 – 95% of all assaults with a deadly weapon. Why are we focusing on her hormones? And yet, just try to imagine a man who has just killed his girlfriend after a quarrel about her (suspected) infidelity, pleading his innocence in court because his behaviour was due to unusually high levels of testosterone – and having the judge suspend his driver’s licence for one year! PLease see www.studd.co.uk if you want to know the medical science about pms - a condition that ruins 5% of women's day to day life. My Mother was not fully functioning because of hormone problems (PMS, PND, Thyroid disease) and by sister and I have hormone problems too. Did you know that Hippocrates, the Greek Physicaian, first described PMS over 2000 years ago and it was given little clinical attention untill the the 20th century. Katharina Dalton fought for us despite ridicule and criticism, and was involved in establishing the National Association for Premenstrual Syndrome (NAPS) which has helped and is helping sufferers to gain a unique insight into the condition and associated conditions...you only have to access this website to see how women and their families have and are suffering (as well as Professor John Studd's website, and Nick Panay's website). Susan Girdler (Chapel Hill, USA) was involved in genetic findings in 2007 - what is being done to improve research and better treatments since this time? Crime times are not just involved in hormone/neurotransmitter criminality in women, but also in men. Perhaps you might like to read 'Nicola', by Nicola Owen (Amazon Books). I would never ridicule anyone's health problem, and I wish for the same. I hope that research is speeded up soon so that our non-tangible condition (PMS) is clarified as I would truly not wish it on my worst enemy. Huggy, Puggybabe, I think you may have missed my point. Part of the problem is that I'm pulling bits and pieces out of book chapters and it's awfully difficult to find sections that don't refer to other bits of the book. I've just realised, for example, that there is no mention of Katharine Dalton's research, which is reviewed in detail in another part of the chapter. All I'm saying is that there is no consensus on this issue, even among women. Many feminists have argued that PMDD was deliberately contrived by a patriarchical medical profession for the very purpose of subordinating women. If you women can't agree, we men certainly aren't going to know how to deal with things. By the way, I simply said that no lawyer has successfully defended a violent male client on the basis of excessive testosterone levels. I'm aware of the research, which is cited extensively in the chapter. Great argument. High testosterone as a murder defense! Why would this not work? But .... Do you have links to the cases you cite? Im experiencing pms at this very moment and I swear my husband and I were arguing and my reflex wanted to throw this keyboard right at his head... then I got up with the keyboard and approached him. I wanted to hit him so bad but I didnt.. and I began to cry.. the anger was hurting so bad.. like I had to release it and it came out in tears. It was hard. I blame the pms. 4real.